I worked on the big rose doily a little bit today. It didn’t go well. There are little roses in between some ruffly flowers and the tiny inner petals are giving me fits. Since I didn’t get much done on that doily I will post a picture of a Bruges lace piece. This bigger crochet runner was hard to make look nice in a photograph. It was also hard to crochet and get everything to go together. I would call it a learning project. I am a little rushed today. Life obligations are interfering with my crafting and blogging. Don’t you just hate when that happens. 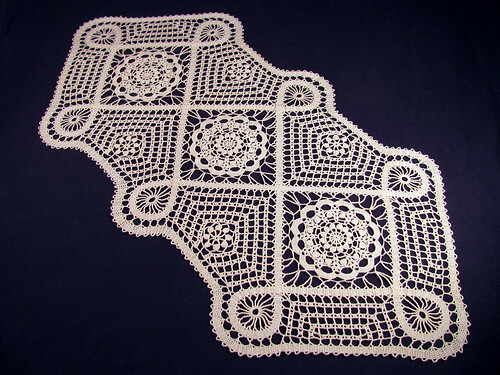 This entry was posted on Wednesday, February 4th, 2009 at 3:00 am and is filed under Crochet and Lace. 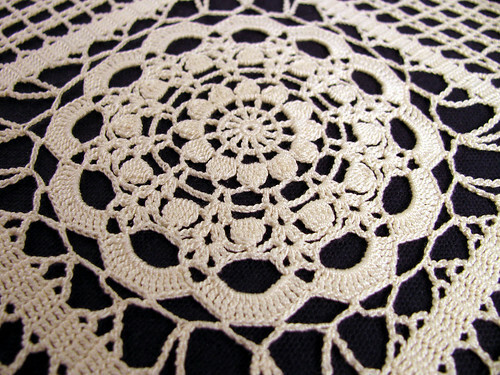 Tagged: Crochet, Doily, Lace, Needlework, Thread. You can feed this entry. You can leave a response, or trackback from your own site.